Adaptive filters are required when it is necessary for a digital filter’s characteristics to be variable, adapting to changing signal characteristics. Such filters can be classed as ‘self designing’ in that they rely upon a recursive mathematical algorithm, that allow them to perform satisfactorily in an environment where complete knowledge of the signal of interest (desired signal) and noise is not known. As a consequence, adaptive filters, such as the LMS (least mean squared) algorithm have been used in many real world applications such as biomedical signal enhancement, system identification and noise cancellation. The following example demonstrates the enhancement of a 100Hz signal buried in band limited white noise, by virtue of a 30th order FIR LMS filter. 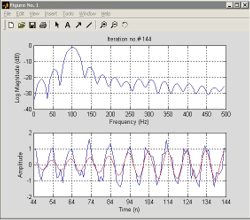 Adaptive line enhancement (ALE) refers to the case where a noisy signal, x(n) consisting of a sinusoidal component, s(n) is available and the requirement is to remove the noise part of the signal, n(n). This may be achieved by the arrangement shown below. It consists of a de-correlation stage, symbolized by and an adaptive predictor. The de-correlation stage attempts to remove any correlation that may exist between the samples of noise, by shifting them samples apart. As a result, the predictor can only make a prediction about the sinusoidal component of u(n), and when adapted to minimize the instantaneous squared error output, e(n), the line enhancer will be a filter optimized (the Wiener solution) or tuned to the sinusoidal component.